A massive well done to Steve Howlett, who at the eleventh hour managed to get the amazing Blood Bird to deputise for Jack Harris who was unable to make tonight’s Grapevine due to travel problems. It’s always a great pleasure to hear Blood Bird however, and to see them twice in a week felt like something of a double blessing. The music was opened by David Booth, originally from Derbyshire but now residing in Suffolk. He played and sang tender and melancholic songs covering themes such as being left behind, and trapped in one’s remote village. Apparently and rather incredibly he told us he earlier this year turned 40, and his friends and family clubbed together to get him the funds to buy a rather beautiful mandolin, which he has touchingly named “Meg” after his recently passed away grandmother. It was a pleasing set with lovely songs reflecting experiences of life, the sea, and surroundings, David himself having an easy stage manner and gentle humour. The middle slot of course was filled by Chris and Steph, one half of the excellent Kill It Kid, tonight performing as Blood Bird. They played a couple of KIK songs, and a few blues and gospel covers. Stuart on sound did a great job and they sounded brilliant, as always, and definitely made a huge impression on those hearing them for the first time, as they always do. They played and sang with a passion and intensity, which resulted in Chris blasting his guitar in the set finale and breaking two strings, which he said was a record for him. Mightily impressive from Blood Bird, and they really are a wonderful couple, beautiful people. Cara Winter was making a very welcome return to Grapevine too, this time augmented by cello (Nick Cooper) and percussion (Stuart Pringle) to great effect. Her haunting, captivating and beautiful songs are almost at odds with her delightful humour and banter inbetween, she mesmerised us in song and charmed us with her wit between them. As Steve came to the mic at the end of the set he did not speak for several moments as he said he did not want to break the spell of what we had just heard, such was the magical sound these three made together. Singing from her piano she told us tales of her relationship with her house and as Steve suggested, she really did hold us rapt in her spell. All of the artists playing tonight made special mention of Steve and Grapevine, and what a pleasure it is to play here and how they appreciate the attentive ears of the audience. My thanks to all the artists, Bedfords, Stuart Moore for excellent sound duties, and of course Steve and Jan for Grapevine itself. 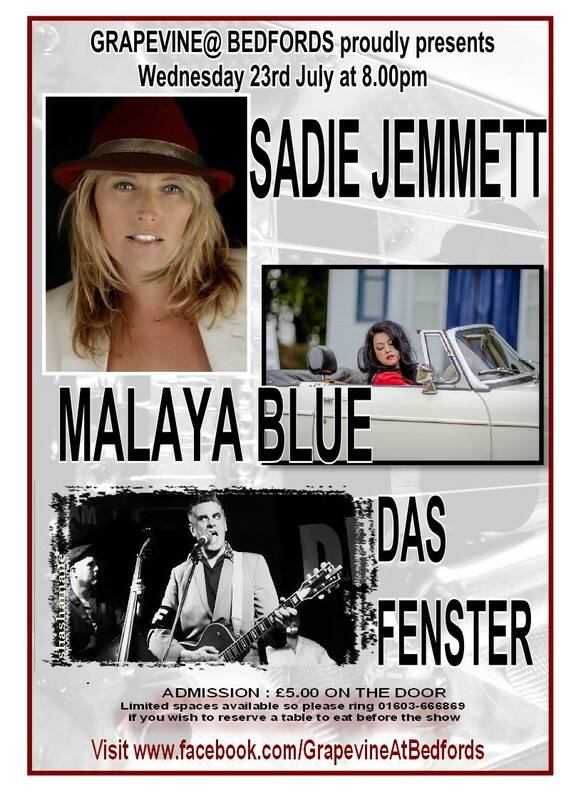 The next Grapevine is Wednesday 23 July, with Sadie Jemmett, my much-anticpated first opportunity to hear Malaya Blue, and a solo set from Das Fenster & the Alibis’ voodoo loving frontman. Three of Our Favourite Singer/Songwriters plus FOOD !!! We’re delighted to welcome back three excellent singer/songwriters to Grapevine@Bedfords for what promises to be another gem of a night for lovers of beautiful music in an intimate setting. Jack Harris – Singer/Songwriter : London-based troubadour and raconteur Jack Harris has wowed us a couple of times already with his great playing, characterful voice, engrossing songs and hugely entertaining between-songs tales. His album ” The Flame and The Pelican ” is one of the best things you’ll hear and we’re delighted to have him back with us. David Booth will be known to many of you for his work with AloneMe/The Floe and for his excellent solo and band work in his own right. He is also an accomplished producer and sound engineer. His songs range from the quietly reflective to the more up-tempo, all delivered with skill and charm. Please remember, you’re welcome whether you’re dining or not, and we all love to see the room full of friendly, attentive faces ! It’s still only £5 on the door, too…which is just daft for a lineup of this standard, so please…..Come On Out !! This entry was posted in Grapevine at Bedfords, live music and dance and tagged bedfords bar, blood bird, cara winter, David Booth, grapevine, kill it kid, photos, review, shashamane. Bookmark the permalink.